Find out what we are doing and where you can find us. Royal Joh. Enschedé has acquired a majority stake in AntTail, a Dutch technology company. As an independent international player in the field of high security printing and security solutions, Royal Joh. Enschedé wants to broaden its services with digital transport security solutions and the authenticity of high quality production and products. AntTail provides solutions to monitor supply chains with sensors and cloud services. A complete audit trail is available from the manufacturer to the receiver, which prevents counterfeiting. Royal Joh. Enschedé distinguishes itself with its current products and services and delivers secure printed material with a high level of reliability according to customers’ specifications and planning. The company wishes to expand its security services with the addition of digital communication. As a service provider, AntTail has experience monitoring shipments using sensors and services to register and validate deliveries. With a focus on the pharmaceutical market, where falsification of medicines occurs, quality assurance of the products can often be of vital importance. This knowledge and experience will now be available to Royal Joh. Enschedé. The customer base of AntTail includes multinationals such as MSD and Ingersoll Rand. On 24 May 2018, AntTail received the Internet of Things Award 2018 from the IoT Journaal. Royal Joh. Enschedé started out as a small book printer in 1703 and grew into a major company in Haarlem. Royal Joh. Enschedé is internationally known for its attractive banknotes and stamps. With special attention to details, technical expertise and quality, Royal Joh. Enschedé is the specialist for special, secure and highly trustworthy print work as well as security solutions. Royal Joh. Enschedé supports products for financial transactions, cash equivalents and certified products such as visas, tax labels, stamps, diplomas, certificates as well as products for the protection of branded products (brand protection). Strengthened by our world-class security printing expertise, we provide anti-fraud and anti-counterfeiting solutions tailored to the specific wishes of our clients. AntTail makes the logistic chain transparent. The products and services developed and delivered by AntTail monitor the temperature of medicine during transport and storage from manufacturer to end user. Thanks to smart sensors, companies in the pharmaceutical industry, health care providers and transport and logistic service providers can track the temperature of their shipments online and safeguard their quality. AntTail’s cloud solutions and "Secure SaaS-service" work with existing solutions in the “cold chain”, making complex implementations and pre-investments a thing of the past. Isle of Man Post Office, presented its latest stamp collection, an innovative miniature sheet showcasing Bloodhound SSC. The stamp collection is in celebration of the bloodhound Project and its connections to the Isle of Man. The stamp sheetlet, includes two stamps and two labels, with one featuring the legendary Richard Noble and current world record holder Andy Green, BLOODHOUND’s driver. To ensure the miniature sheet reflects technical innovation it includes three special print finishes; metallic ink, varnish and thermochromic ink, which disappears when heated to reveal the inside of the BLOODHOUND car. These stamps will be available to purchase via Isle of Man Post Office from September 22, 2017. The Bloodhound SSC miniature sheet has been printed by Joh. Enschedé Stamps B.V. In this year’s edition, a jury composed of seven philatelic experts, scrutinised all the displayed entries based on the theme “Castles”. The jurors casted their closed ballots and they proudly announce Posti Group (Finland) as the winner of the 2017 EUROPA stamp Jury Prize with Anssi Kähärä’s Lumilinna snow castle. The awards for the 2017 Jury competition were delivered to the postal philatelic community on Saturday, 16 September 2017, at Brussels Town Hall, during the Belgian Philatelic Grand Prix ceremony, where philatelists and dignitaries from all over Europe gathered. The Lumilinna snow castle postage stamp has been printed by Joh. Enschedé Stamps B.V.
PostNL, presented its latest stamp collection, sketches designed by Viktor & Rolf. The stamp collection is in celebration of the designer duo’s 25th anniversary. The stamp sheetlet, sold in sets of 10 for € 7,80, reference sketches that formed the basis of recent collections: wedding and evening dresses; footwear; an eye; the V&R logo and a flower are all portrayed on the special stamp edition. This sheet features all kinds of sketches and doodles used by the fashion designers as a means to express their creativity. These stamps will be available to purchase at all Bruna shops and via Collectclub.nl from September 11, 2017. The Viktor & Rolf stamp is part of PostNL’s Art and Culture collection, and has been printed by Joh. Enschedé Stamps B.V.
On September 6, Joh. Enschedé Stamps B.V. celebrated the signing of a long-term contract with the Posten Norge AS for the production of postage stamps for the Nordic mail and logistics group. The contract has a term of three to five years and was awarded to Joh. Enschedé following the completion of an official tendering procedure. Jos van Leeuwen, CEO: ”We are very proud to have been selected as the best provider in this competitive tendering process, that meets the high requirements and expectations of the Posten Norge. We welcome the continuation of cooperation with Posten Norge, which has now been running for over 17 years!" Posten Norge (established in 1647) is a Nordic mail and logistics group that develops and delivers complete solutions within postal services, communications and logistics, with the Nordic area as its local market. The Bandung World Stamp Exhibition is a five days event which was held at the Trans Studio Convention Centre in Bandung, Indonesia, from 3-7 August, 2017. This event showcases products such as traditional and thematic philately, various postage stamps, postal stationery, and much more of the philatelic industry. The Joh. Enschedé delegation engaged in on site communication with potential and existing clients and successfully presented its latest designed stamp and approach for the future. From next year Royal Joh. Enschedé will be focusing as a High Security Printer on the international market for Stamps, Visas and Tax Labels, together with interesting growth markets such as ‘brand protection’ and ‘anti-counterfeit’. This new focus means that the company will cease the production of Banknotes in the near future. The Board and Shareholders have decided on this modification of the strategy as a result of market developments and the company’s position in the various markets. The new focus means that the banknotes division will be closed, which unfortunately will lead to a considerable loss of jobs. The Board of Royal Joh. Enschedé informed the staff of this at a special meeting today, Thursday 1 December 2016. The international market for banknotes has been characterised by overcapacity for years, whereby many parties are competing for tenders with rock-bottom prices. State printing offices from various countries are increasingly also competing, winning export orders at unrealistically low prices alongside their protected position in their home market. This is creating even greater pressure on prices and an imbalance in the competitive landscape. Even with highly efficient business processes and much enhanced productivity, Royal Joh. Enschedé cannot operate at such even lower price levels. It would mean that the company would have to start consistently executing loss-making orders, which is not commercially prudent. Over the recent period Royal Joh. Enschedé has looked for a collaboration with or acquisition by a strategic partner in order to gain a more secure position in the market and reduce the risks. This has not been successful. In order to safeguard the future of the other activities, the company’s Board and Shareholders have decided to terminate the sale and production of banknotes. This means that the current order book will be fully completed, after which the closure of the banknotes division will take place at the start of next year. Unfortunately this will involve job losses. With a modified, smaller organisation and the new market focus, the Board and Shareholders of Royal Joh. Enschedé believe that the company’s future survival can be secured and a basis for healthy growth can be established as a leading High Security Printer. This year marks precisely 150 years since Royal Joh. Enschedé started the production of postage stamps in 1866. Once a small printing shop in the centre of Haarlem, nowadays it’s in a large - highly secure - printing works in the Waarderpolder just outside the centre of Haarlem. The first stamp to be printed was the second issue of Dutch postage stamps depicting King Willem III. Joh. Enschedé took over the printing of stamps from the State Mint. For many decades all Dutch stamps were printed here. Nowadays Joh. Enschedé designs and prints postage stamps for more than 100 countries worldwide, including for the Dutch market. Over the 150 years that Royal Joh. Enschedé has been producing stamps, the printing techniques and methods used to produce stamps have changed considerably. In the past, production mainly used engraving, screen-printing and later also offset printing. Today there are many other options, such as the use of cold foil, various types of varnish, iriodin and laser perforation. There are also new developments which replace the traditional sheet of stamps, such as booklets, rolls and other unusual forms of execution and packaging. This has greatly increased the possibilities, and there is greater scope for creativity and personal input from the designer or the client. Joh. Enschedé is currently working on introducing ‘traditional’ stamps with new digital technologies such as augmented reality in the near future. This will open up yet another new world of possibilities. For the occasion of 150 year stamp production we invited employees of sixteen postal organisations worldwide in the period from 10 till 13 October 2016 to participate in a onetime experience called Fundamentals of stamp production. In this 4 day course the participants learned everything about the production of stamps, from paper and inks till packing and shipping. They even visited a sorting centre of the Dutch post. To mark the 150th anniversary, Joh. 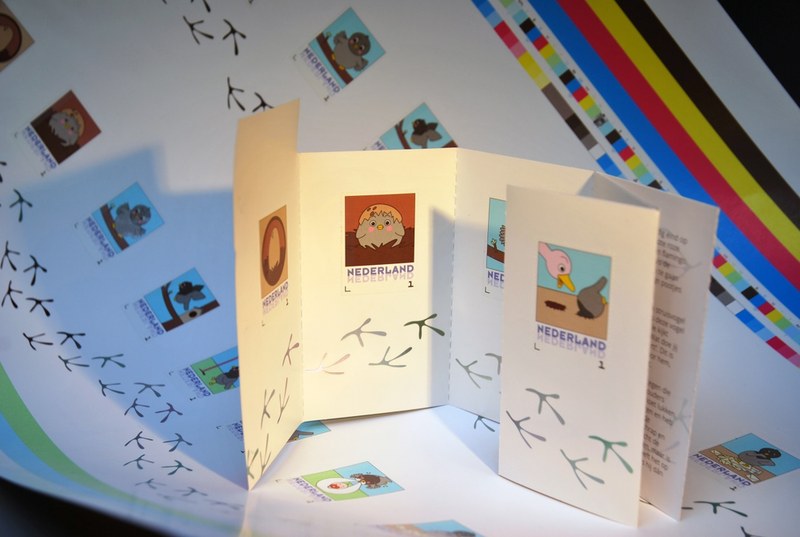 Enschedé has designed a new product in collaboration with PostNL: a book of stamps that reads like a strip cartoon. When you open out the booklet, it reveals 10 sheets, each bearing their own postage stamp. This anniversary booklet tells a story of a carrier pigeon who is born in a birdhouse, but has no idea what sort of bird he is. He sets off to find out and encounters various types of birds on his travels, as a result of which he finally discovers his true vocation. This stamp booklet is a new way of packaging stamps, unlike the traditional sheet or roll, and also offers far more scope for creativity and room to tell a story. This stamp booklet incorporates a number of printing techniques which have not previously been used for Dutch postage stamps. One of these techniques is the use of cold foil and spot UV varnish. With cold foil, a layer of foil is pressed onto the paper, after which ink is applied overlapping the foil. This gives the inks a spectacular effect. Joh. Enschedé is demonstrating with this booklet that there are many possibilities beyond the traditional postage stamp. The booklet is also a unique collector’s item because of the nature of the product, the limited print run and the techniques used. We are proud to have introduced a new house note on the first day of the Banknote Conference in Washington. The inspiration for this design is the story of Little Red Riding Hood and the Dutch Design Team choose “Expect the Unexpected” as the theme for the design. The note is created by Royal Joh. Enschedé in collaboration with Landqart, PNO Global, SICPA and KBA, each bringing their own expertise and capabilities to the table. The video that was shown during the presentation is available below.